South Africa’s X’Trapolis Mega trains. Photo: courtesy of Alstom/Karl Shoemaker. A ceremony was held to celebrate the start of commuter service for 13 X’Trapolis Mega trains from Gibela, Alstom’s South African joint venture (JV) partner. Jacob Zuma, the State president of the Republic of South Africa, unveiled the first new trains at Pretoria station in front of more than 2000 guests. 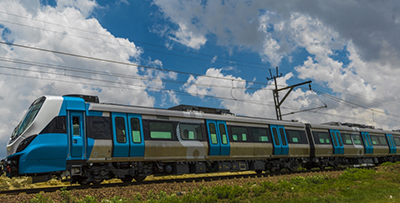 The trains are part of a fleet of 600 new trains being built by Gibela for the Passenger Rail Agency of South Africa (PRASA). The new trains will initially run in the Koedoespoort – Rissik Corridor in Pretoria with a total of 146 trips a day. The X’Trapolis Mega is a new train in Alstom’s X’Trapolis suburban range. The first 20 trains have been manufactured at Alstom’s Lapa factory in Brazil. Gibela’s manufacturing facility in Dunnottar is currently under construction and is expected to be completed by the end of 2017. The on-site Training Center is already finished.